Books-A-Million (BAMM), the third-largest bricks-and-mortar bookstore chain, posted sluggish earnings results Thursday for the first quarter. Revenue for the 13-week period ended May 1 was $117 million, down 1% from the same period in 2009, while net income dipped by about the same percentage to $2 million. Same store sales dropped 3.6%, which Publishers Weekly reported was attributed to "sluggish store traffic and continued difficult comparisons to last year's first quarter." Is the Twilight Series Dimming? That decline has a lot to do with the absence of a new novel in the quarter from author Stephenie Meyer, whose Twilight romantic vampire series is an international phenomenon. The four books have sold more than 100 million copies worldwide and are the basis for two movies, with a third to debut in June. Meyer has put plans to publish a retelling of the first of her vampire tales from a different character's viewpoint on hold, but a novella related to the series, The Short Second Life of Bree Tanner, is slated for June publication. The slight dip in first-quarter earnings included a net gain of $470,000, paid out 12 months ago because of forfeitures of stock grants and other compensation for a CEO who resigned during the first quarter of last year. Then-CEO Sandra Cochran resigned in March 2009 to become chief financial officer at Cracker Barrel (CBRL), and her position was taken over by Clyde Anderson. "While we continued to face a challenging sales environment during the period, I'm pleased that our ongoing discipline in cost control and inventory management delivered solid financial results," CEO Clyde Anderson said in a statement. He added during the earnings conference call that the bookstore chain was pleased with the performance of the bargain books and children's book categories, while sales of adult fiction and cookbooks were also up. 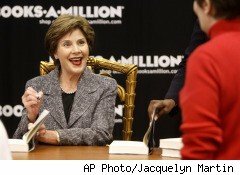 Looking ahead to the second quarter, Anderson pointed to a strong slate of titles due out during that time -- including former First Lady Laura Bush's just-released memoir, Spoken From the Heart, already "off to a strong start" -- and to a greater emphasis on cost containment. The company also announced that its board of directors approved a quarterly cash dividend of 5 cents a share that will be paid out to stockholders on June 17.